Today, technically, the full moon for March is this morning! I shuffled my Court Cards from Ciro Marchetti’s Tarot of Dreams to see whose energies will be leaving me over the next couple of weeks…. and drew The Queen of Wands. Shame. 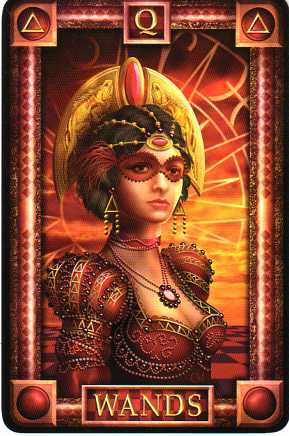 I really liked her – she was my Incoming Energies card from the last New Moon. She has many fine points that I was finding useful – such as that can-do attitude. This manifested as a properly cleaned out greenhouse AND a damn fine lemon and almond cake (that has taken me four attempts to get right!). Maybe I could keep her best bits and get rid of her less desirable attributes in the time running up to the New Moon? Let’s see, what ARE her less desirable attributes?! Looking at this Queen in particular, she is masked. Maybe I can stop pretending to be something that I’m not in an area of my life? Yes, I would be happy to give THAT particular aspect of the Queen up! She’s also wearing a very lovely frock with quite a lot of bling. And to give up the desire for Nice Things….acquiring just for the sake of acquiring….might be sensible given that it’s Miserly Miserable March. What other energies of this Queen of Wands could I work on relinquishing? Copyright: All art copyright to Ciro Marchetti. If you’d like to buy this deck, please check out Ciro’s website – there’s only a couple of dozen of this deck left! And there’s even a Tarot of Dreams app you can buy for your ipads! Since I am a Queen of Wands myself (Birthday in few days) I would like to tell you that this Queen is dominating and a little bit masculine as well. She is adventurous and she loves good things around her. She seeks attention and she needs to be the leader in the gang. She is fiercely loyal, self-reliant and very possessive. The Negative aspects of her personality are she is flirtatious, she is brutely honest, and sometimes she is too dominating for the other person to handle.